Having reliable machinery and great equipment is essential when you want to get the job done right and when you need to get it done in a timely fashion. We are here to review several different products for you, those being weed eaters; today we have the 6 best weed eaters and trimmers out on the market today. We have even made a little comparison table and each weed eater has its own little review to help you decide which product is right for you. We’ve compared the weed eater’s on a number of different fields such as engine power, CARB compliancy, The Start System, as well as several other features which are listed on the table below. Let’s see if we can make the choice a little easier for you! 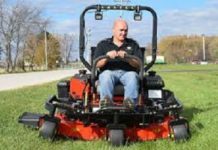 The Tanaka TCG is the next grass trimmer and brush cutter that makes out top 6 list and there are several reasons for it; any person who needs to trim so grass would be more than happy to have this fine piece of machinery. The 21cc 2 stroke engine provides more than enough power to get the job done! The whole thing also just weighs under 9 pounds which means it’s quite light weight and easy to use for an extended period of time. And the whole time you are using it you won’t have to strain your back once because the shaft is an impressive 60 inches long. Another thing that does need to be mentioned is that it is of course CARB compliant which means that it has been deemed environmentally friendly, or at least more so than many other brush trimmer models. The next stop on our journey of weed eater or grass trimmer reviews is the Black & Decker LST136W and there is a very good reason that this machine is on the list. 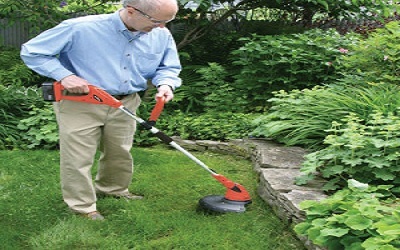 This weed eater offers the most in versatility because it has a special dial which allows you to choose the 8500 RPM setting for maximal power or the 6500 RPM setting which provides the user with maximum battery life; so whether you need to cut lots of grass or trim some thick bushes it is definitely up to the job and the 13 inch cutting diameter makes sure of that. This is in part because of the 40W lithium ion battery that can hold up to 30 percent more energy than an average rechargeable battery. And another thing that will keep it going for a very long time is the automatic feed spool that will continuously supply new cutting wire. And for even more versatility the grass cutter turns into a weed trimmer with the twist of the shaft so there’s no need to disassemble it and reassemble with the new attachment. And even though it doesn’t come with the separate attachments it is in fact compatible with several other tools such as an edger and a blower too. This item is really great because while it is by far not the most expensive item on the list it will do the job for sure, and for the price it is an excellent machine. It may not be for every professional job but for around the house the Black & Decker LST420 will certainly get the job done. 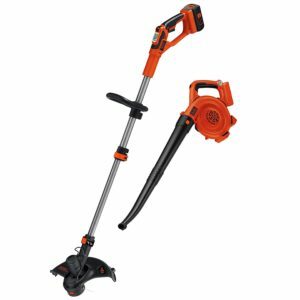 It can covert effortlessly from a trimmer to an edger with wheels so you can really make the lawn look great. The motor features a special power drive transmission which means that you are getting the absolute most power out of the motor as possible, which of course translates into increased cutting and trimming power. It also features run time extension technology which allows you to switch between higher power or longer battery life so that you can do the job the way you want to do it and the way it needs to be done. Even better it comes with 2 2.0 amp lithium ion batteries that each deliver 33 percent more power than a standard battery pack. It also has a shaft in which the height can be adjusted for maximal comfort; not to mention that the cutting swath is a full 12 inches! It’s really great because it weighs just over 5 pounds so you don’t have to be a muscle man to operate this fine piece of technology either. This is a truly excellent machine because the 40 volt max lithium ion battery provides up to 2 full hours of cutting time so that you can get the whole job done before the battery life runs out. What also helps you get the job done on time is the fact that the cutting swath for this machine is a full 13 inches so you can cover large areas in just a matter of time. What is even better is that the Black & Decker LCC140 is a 2 in 1 tool because it can convert very easily from a trimmer to an edger so that you can make those straight lines that everybody wants. Moreover it comes with a third tool too, that being the sweeper/leaf blower that lets you clean up the mess is a flash. The spool is also self feeding which means that you don’t have to bump and pull to keep getting new trimming string; it does it by itself! Something that you can select however is the trimming power because you can choose between maximum power and a longer lasting battery depending on the job that you are doing. The next item on our top 6 list is this fantastic piece of equipment that will serve any handyman or landscaper to the utmost of their needs. One of the great things about the Poulan Pro is that you won’t have to wait to get started on your work because the sure fire pull start system makes sure that it will start without a hitch and won’t leave you standing there with a dead trimmer. 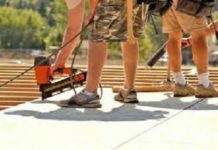 One of the best things about this particular model is that it comes with a total of 6 different attachments so you can complete any job that needs doing. 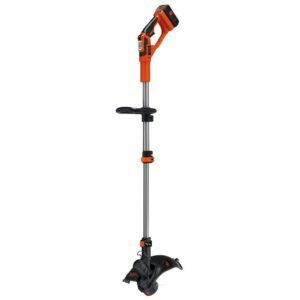 It comes with a trimmer, an edger, a blower, cultivator, brush cutter, and a pole pruner as well; you can literally complete all of your landscaping jobs with this one tool. What’s even better is that these attachments are very easy to take off and on for maximum versatility. This trimmer will last a very long time as the durachrome cylinder guarantees extra-long engine life that will keep this particular machine running for as long as you need it to run. One thing that does need to be mentioned is that it is not CARB compliant and is therefore not for sale in California. 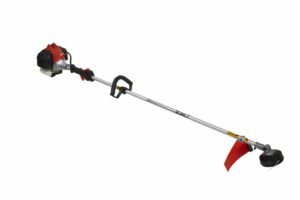 This is the final of 6 products in our review of top 6 weed wackers and bush trimmers however it is definitely not at the bottom of the list due to its low ranking; this is a very good machine and Husqvarna has been providing the public with many great products for many years. One of the really great things about this weed eater is that it has an air purge which means that the machine is far easier to start due to the carburetor and fuel tank being air free. Not to mention that it has smart start technology which makes things just that much easier for everybody. Another thing to be said about the fuel tank is that it holds enough gas to run for close to 2.5 hours; that’s enough time to get the job done even if it is the biggest of jobs! 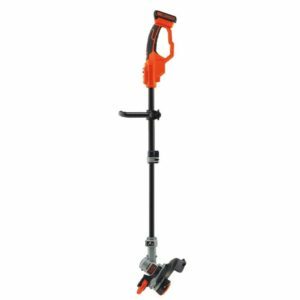 What’s also great about this product is that it has a detachable shaft for easy storage and transportation, as well the shaft can hold several different attachment so you can do whatever job needs doing! 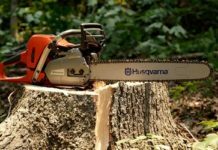 The Husqvarna weed eater is definitely one of the stronger players on this list, if just because of the fact that Husqvarna is known to be reliable. Simply put a weed eater is tool that is used both by people around the house as well as professional landscapers which allows them to trim grass, weeds, and bushes. A weed eater is simply a motor at the top of a shaft with a spinning part at the bottom, the spinning part has a plastic string which protrudes out of it that cuts anything in its path. 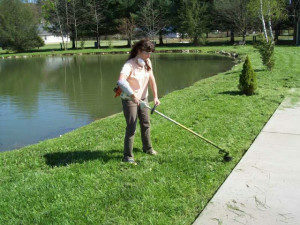 A weed eater can be used to trim grass, do edging, prune bushes, and do many other things too. In essence it is a handheld lawnmower combines with a handheld bush cutting saw. A weed eater works very simply, whether it is powered by an electric source or by gas the concept is quite the same. The engine moves the spinning shaft at the front which contains a rope that is meant to cut through grass and bushes. The front spins at excess of 7000 RPM which is enough to cut down anything in its path. It’s a handheld machine that requires the constant pushing of a button. Other than that, unless you would like us to explain exactly how a combustion engine or an electric engine works there is not too much else to explain; it’s a spinning head powered by a small engine. There are a number of different types of weed eaters available on the market. The first distinction to be made is between gas powered and electricity powered weed eaters, each having their own pros and cons. The gas powered ones are of course far more powerful and reliable than the electric ones, while the electric ones are far more ecofriendly and far less noisy too. Another distinction between weed eaters is that some have a straight shaft while some have a bent shaft; it really depends on the job that you are doing when choosing a straight or curved shaft; the curved shafts are a little better for maneuvering in tight spaces however it may throw off the center point of gravity and make it harder to cut straight lines. 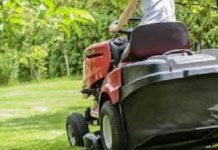 In terms of electric weed eaters it is recommended that you not get a power cord or a standard battery pack as lithium ion batteries will last far longer than an average battery and are far more reliable, not to mention that power cords are always a hassle to use because they always get in the way. Finally different weed eaters meant for different jobs will have different attachments. 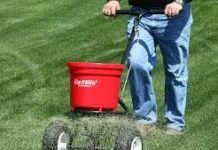 A simple grass trimmer will just have a string spool while an edger or bush cutter will have an actual blade; once again it all depends on the job that needs doing. Ok, let’s keep this short and simple because there are just a few features you really need to watch out for when buying a weed eater. First of all try to get a gas powered one as they are just faster, stronger, and better. However, if you feel inclined to get an electric one then it is recommended that you get a lithium-ion battery, and 2 of them if possible so you can always have one fully charges while the other one is in use. You also want to look out for how tall it is because you don’t want to have a weed eater with a 65-inch long shaft when you yourself only stand at 5 feet tall; that will make the job very awkward so always make sure that the weed eater you get is size appropriate for you. Another thing that you want to pay attention to is the power output of the engine which translates into RPM. Whether it is a gas or electric powered motor this is very important because it will define what jobs your weed eater can and cannot do. A few thousand RPM can make the difference between just being able to trim the lawn and being able to cut back full sized bushes. Which brings us to the next point, that the weed eater should be able to hold several different accessories so that you can do multiple jobs at once. And finally you want to make sure that it has some kind of easy start system so that you don’t rip out your own arm trying to start the thing. What Accessories Do People Buy For Their Weed Eaters? The fuel-oil mixture ratio for all Weed Eater products is 40:1. Do this by mixing 3.2 oz. of two cycle air cooled engine oil with one gallon of regular gas. Over a period of time oil will separate from gasoline so shake it every now and then to make sure it stays combined. Can I leave Fuel in it? The short answer to this is no; it will create deposits in the machine much like cholesterol in your arteries, make sure to use the fuel or to empty it after. Most weed eaters have a simple on/off switch as well as pull chord to get it started; pull hard! Most weed eaters require the continuous pressing of a button to keep it running so once you let go it will automatically shut off. There could be several reasons for this including an unplugged spark plug, the wrong mixture of oil/gas, make sure the on/off switch is in the on position, and make sure the air filter and fuel filters are both clean as well. The air filter should be cleaned after every 5 hours of use; do this by using warm and soapy water. The trimmer line will break if it hits objects that are too hard such as big trees, rocks, or anything else like this; these machines are meant to cut grass and small bushes not fully grown oak trees. Just for some final thoughts it is important to remind people that the difference between gas and electric powered is quite great so while also keeping the environment in mind this is definitely a consideration to be made. Also always be sure to consider the way in which you want to cut; whether you want a single exit or dual exit trimmer, and whether you think you need an easy start system or not. After all has been said and done it would seem that the best weed eaters are those that have the most power and the most RPM, have the most attachments, and can last the longest without refuelling or recharging. 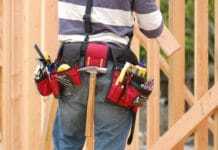 We would highly recommend going for the Black & Decker Models or the Husqvarna as those are very reliable brands.